Gary Barclay has been involved in the sport of swimming for many years. Gary competed at a National and International level and then swapped the swim suit for a stop watch and coaches swimming for the next 12 years. Gary has two children who swim and has a strong understanding of the nutritional requirements for swimmers. Megan McDonald is the mother of two girls who swam for many years at a National level. Megan has used all her experience in the preparation of meals and snacks for her daughters in the book and provides a real parent balance to the contents. The base content for the book has come from registered nutritionist Sarah Burkhart who has expertise in all areas of nutrition at a base and elite level. 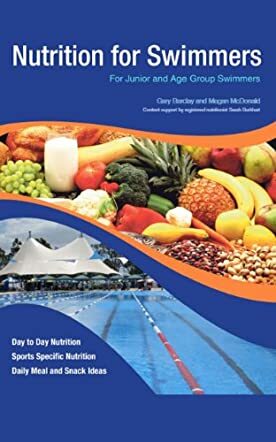 Nutrition for Swimmers - For Junior and Age Group Swimmers by Gary Barclay is a guide to swimmers on how to manage their diet. The author throws light on daily meal and snack ideas and tells how to chart out the day to day nutrition diet. The author has put together key facts, but he advises parents and children to consult a dietitian for personalized nutritional plans. As the author puts it, 'Sports nutrition is the principle of tailoring specific food and fluid requirements to an athlete in order to maximize physical performance.' That kind of sums up the book. The book is very useful and is very easily comprehended. There are a lot of recommendations for daily meals and snacks which is very useful for the swimmers' baseline diet. The author has covered every angle that is useful to a swimmer. A vegetarian diet is also charted out for Vegan swimmers. The author has also written the fluid diets separately. The food to consume after a training session, the diet plan, fluid diet, and how to prepare oneself before a competition and after a competition in terms of diet is also discussed in the book. I found the book very handy. I recommend all swimmers to own a copy of this book because it is helpful and it will help in bringing about a considerable change in their routine.